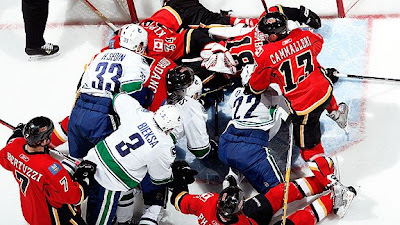 Last season, only the Vancouver Canucks made it out of the Northwest division and into the playoffs, which made it the only division that did not see at least two representatives in the post season. The Calgary Flames were the only other team that were in the hunt for a bid into the playoffs, with 94 points. The Minesotta Wild finished out a mediocre 86 point season. While the Colorado Avalanche and Edmonton Oilers locked up the two worst records in the league with 68 and 62 points respectively. The Vancouver Canucks will once again be the favorites to win the division next year, after producing the leagues best record and grabbing 117 points at the conclusion of the season. What would you expect when you play the Avalanche and Oilers a combined 12 times? Without a doubt the Canucks are a strong team with stars like, Roberto Luongo and the Sedin twins, but a weaker division that they went 18-4-2 in may have aided in their success. After making a run at the playoffs late last season and falling short, the Calgary Flames have elected to keep a veteran core of players in tact and provide them with another shot at making it into the post season. The main focus of the Flames' off season was to re-sign its own players, they only added two players, a depth forward and defense man Chris Butler. Calgary may be the only team that will have a chance at catching the Canucks, and that's a long shot. Minnesota, the State of Hockey, went another season without playoff hockey, something the Wild have not accomplished since they won the division in the '07-'08 season. It has been a busy off season for the Wild, they fired and signed a new coach, and signed Devon Setoguchi and Danny Heatley. Will the additions of Heatley and Setoguchi give the Wild that extra offensive production they need to make it into the post season dance? Heatley is a former 50 goal scorer and Setoguchi has scored at least 20 goals in three straight seasons. That seems like a significant offensive push. The Avalanche, addressed their league worst defense with the additions of defense man Shane O' Brien and goalie Semyon Varlamov. Backing up Varlamov is veteran goalie J.S. Gigeurre who has had recent trouble with injuries. The number two draft pick of last season's draft, Gabriel Landeskog, may jump right into NHL play and make an immediate impact along side Matt Deuchene. The Aves still need a few seasons to develop into a top tier team in the league, and next season shouldn't be much better than last year. The league's worst team did take a few steps during the off season towards fielding a better roster at the start of next season. They signed Ben Eager, Andy Sutton, and Eric Belanger, and also brought Ryan Smyth back to the Oilers for his second tenure with the team. These additions will bring an older feel to a team that is chalk full of young talent. The newest addition to the young cast is last year's number one pick Ryan Nugent-Hopkins, who is not guaranteed a spot in the opening line up roster. Although next year should be another tough season for the Oil nation. Overall, the Northwest seems very sub par once you get past the Vancouver Canucks. The rest of the division has potential with strong youth movements, but will take some time to really develop into contenders. The Canucks will likely pounce on the division again next season, but the likelihood of them being the only team to make it into the playoffs is slim. The Wild are my bet. All together this division is probably the weakest division and easiest to play in, outside of the 'Nucks.